There's renewed concern about speed on O'Kelly Chapel Road after video of a dramatic wreck and rescue in Chatham County goes viral. 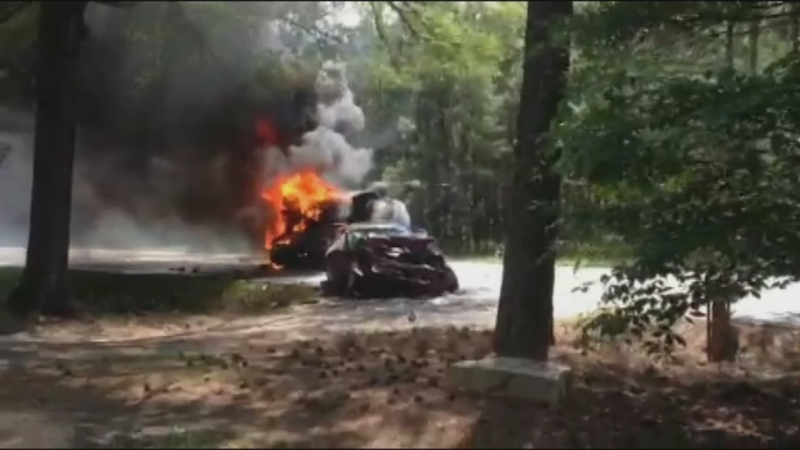 CHATHAM COUNTY, N.C. (WTVD) -- There's renewed concern about speed on O'Kelly Chapel Road after video of a dramatic wreck and rescue in Chatham County went viral this week. The speed limit on the road is 50 miles an hour, but some people think it needs be dropped to prevent another accident. By every account from neighbors, something needs to be done. They say that's been the thought in the area for years. Evidently, even the DOT has looked into it, but nothing has changed. "If a car was coming down this road, they probably wouldn't even notice these bikers going by right now," said concerned resident Courtney Hamilton. "A lot of people go pretty crazy fast down here not following the laws or anything." Speeding cars, pedestrians, bikers, and blind spots around winding curves are the norm. Marcus Mobley said he walks the Tobacco Trail crossing busy traffic at least once a week. "Even at night, you know driving this road at night time when there's deer and stuff out, it's just really bad," said Mobley. The worries have grown since Sunday's explosive crash on O'Kelly Chapel Road near N.C. Highway 751. Eyewitness video captured a Good Samaritan pulling a driver to safety after investigators said he crossed the center line and collided with another on-coming vehicle -- seriously injuring the couple inside. Amazingly, everyone survived. "I drive it pretty much every day and I know that there's a few passing lanes that are kind of around blind turns, and that tends to cause almost a few wrecks every week," said concerned resident Rob Wohlfarth. DOT officials told ABC11 that they have examined the road for years. In 2010, they dropped the speed limit from 55 to 50. In 2012, there was public outcry to slow down traffic even more. Despite DOT findings that drivers were averaging 58 miles-per-hour in the area. They elected to keep the speed the same because they discovered drivers essentially slowed down near the Tobacco Trail crossing, where most bikers and pedestrians cross. "I think people on the trail crossings need to pay attention to the car traffic and I think the car traffic, you can obviously see those yield signs, I think they need to pay more attention to the traffic trying to cross the roads," said Wohlfarth. Some have suggested a flashing light would help. Following Sunday's crash, DOT officials said they're collecting more data and will use it to examine further. However, traffic engineers don't anticipate changing the speed limit or anything else.